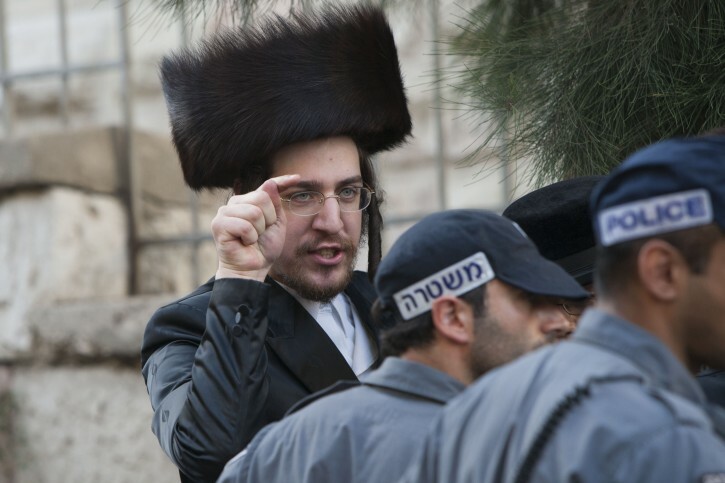 Jerusalem - Dozens of haredi (ultra-Orthodox) protesters and police clashed on Saturday during a demonstration against the desecration of the Sabbath on Jerusalem’s Hanavi’im Street. The protest was against the opening of the Karta parking lot, located near the Old City’s Jaffa Gate, on Shabbat. Protesters called police on the scene “Nazis,” according to Channel 10. The Chasidm are being michalal Shabbos by their actions too! They're cowards, bullies and entitled, spoiled brats. If they actually came up against real Nazis instead of police who have to treat them with kid gloves they'd figure out the difference pretty quickly. What are they nuts? Shabbos is not for protesting! Leave the protesting for after Shabbos! Some of these people are so self-righteous about what it is that they are protesting, that they will sometimes violate Shabbos thinking that they have a heter. The truth is, that they really don't care about Shabbos all that much. They just want THE OTHER GUY to care a lot. These idiots are beginning to become a cancer on the klal and have lost any degree of sympathy they might have ever had. Too bad the police treat them with such deference. Their weekly demonstrations are a much greater chilul hashem than anything the frei yidden who drive and park at this lot might be guilty of. Keep up the holy fight my dear brothers in meah shearim. Soon we good yidden will see all of Israel closed shabbos. Hatzlacha on your rallies. Alterg by your spelling and comment I can see which school you went to. Speaking of blinded hatred. That's not the issue. The Frum definitely don't own the country so what's all this protesting about? Why do they have to protest on Shabbos? Why can't they protest during the week? This way they won't be Mechalel Shabbos and won't force others like the police, journalists and photographers to be Mechalel Shabbos. to #5 please do not use the word "cancer" to refer to another Jew. There is a point to protesting chillul shabbos - all of you who don't get that are putting Western valaues before torah - but in an "oifen hasmiskabel" that will have a positive influence on non-frum Jews. Re the chillul shabbos the chareidim are causing the police to break shabbos! “ to #5 please do not use the word "cancer" to refer to another Jew. Not to mention spitting on people, swearing at them, calling them Nazis and assaulting them in groups with deadly weapons. Little things like that don't exactly make others receptive to your message.